Hi Darlings, I am so excited that my #mimig4simplicity patterns have started arriving in stores!!! They are already online HERE and HERE and of course the step-by-step sew-along videos can be found HERE and HERE. I love this dress so much and it’s so fun to make in different fabrics. I think even a layered chiffon would be amazing too. I used this striped woven poly fabric I found at Hancock. 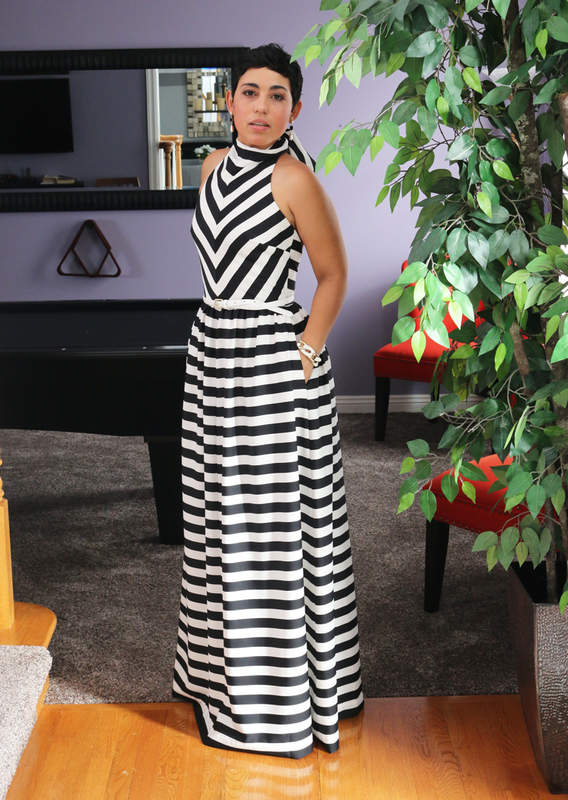 I think the black and white stripe is so elegant. The dress can be totally casual in a cute summer fabric or can be made of a dressier fabric for a more formal look. 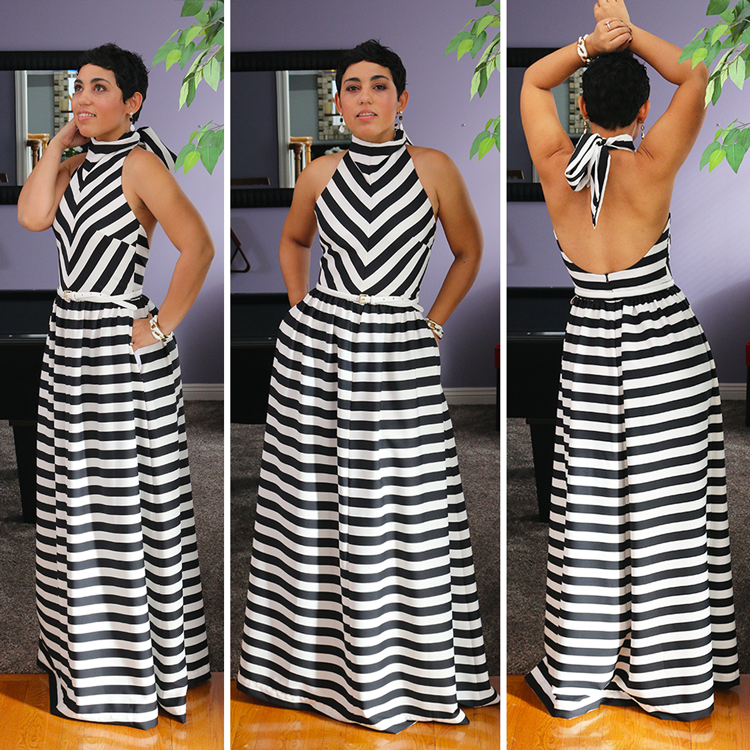 This is the maxi version which is always a favorite and next week I will share my second shorter version. I love it, I don’t sew but I will be learning. Hi I was in the process of ordering pattern 1159 but it’s on back order, and I also see there is a chose to download. Does that mean that I can download that pattern? Awesome! I’ve had my eye out for them in stores. I saw #1167 online yesterday. I will definitely be picking them up. Forgot to mention this would also look fabulous as a jumpsuit! Finally it’s here!!! Yay! So awesome! Keep up the good work. I ran across your Hot Patterns 1161, 1162, & 1163…are these in stock somewhere? Thx. Her patterns go up to a size 24. She sometimes shows you how to do an adjustment for size when using a pattern. I believe Mimi closed the hot pattern site her patterns were featured on. 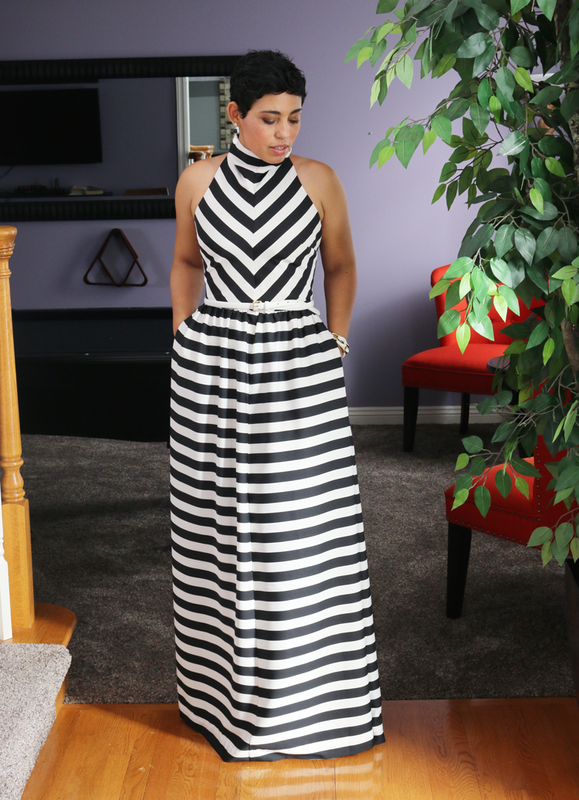 Hot Patterns 1161 is her mermaid maxi which you can find in her store at http://mimigstyle.bigcartel.com/. Hot Pattern 1162, Rock the Casbah jumpsuit is the one I purchased about a year and a half ago. I do not think Mimi sells them anymore. Hot Pattern 1163, which is mimi’s t-shirt, you can probably use her free workout video where she shows you how to make a workout shirt which is similar to HP1163, I hope this helps. I will be purchasing the newest tutorial she posted about a week or so ago, the Red Hot Dress tutorial is on fire. This Dress is so beautiful. Love It !! Love it! Nice but don’t think the stripes would look good on me! But love the dress and pattern. I will definitely pick it up! I am in love! Got to get my back right for this dress. I will have to make several. Sad it is not on line yet, but I will be on the look out, your patterns sell out fast. Keep rocking it MiMi G! Mimi G – you never ceas to amaze me! I love it! this wil definately be a summer staple this year! Oh my! This is truly divine!!! I am ordering the patterns TODAY!!!! As usual, you’ve outdone yourself!! This is really nice and I love the stripes and does the pattern include instructions on how to match stripes, I’m sure you have that included and thanks again Mimi for another great look that we can create! Yaasssss! !! Picking it up today if it’s available! So Haute, Mimi!!! I am super duper proud of you and wish you all the success in the world! To think that a few years ago, I stumbled onto your blog from Fashionbombdaily and have been hooked ever since! Can’t wait to get my hands on these new patterns! I bought some great neoprene fabrics from Jomar and got some leather for the pant suit. I have no words for your awesomeness! I think I saw this fabric in Hancocks and wondered what I could do with it – question answered! Taking my fashion students to both Hancock and Joanns tomorrow on a field trip so I WILL be looking for these! This dress is hot!! Already have material, just need to grab the pattern. Gonna rock this on my cruise in June!!!! Is that all one piece of material or two? Where did you find that beautiful material? Will get this pattern for sure. On Congratulations on the new patterns and may God continue to richly bless you. Awesome!! I can totally see myself wearing this!! Love the scoop back and the fabric! I’m going to have some fun with this one!! How can I get that Black & white dress, I so need one of them!!! Your dress is a total hit! It will compliment all women, including the full woman such as myself. As a new senior citizen, I will be rocking this dress. I love life, unique clothes, and sewing. Way to go. Keep on doing the darn thing. Your design is on point!! Love black and white together! Nailed it MiMi……….just gorgeous work. Love! Will you be offering your patterns in Plus Size?? *Crosses Fingers! Nvrmnd…found them both in JoAnns today! Can’t wait to get started!!! Thanks for letting me know, I updated the links. Yay, been waiting for this! I will be buying this right now! Please, please, please create more patterns. Love your style! I need this dress. I am not a sewer. How much does this dress cost? Mimi, congrats on all your success! I am so proud of all of your achievements doing what you love. You are such an inspiration! I would like to purchase as well. Are you selling this dress? I am not a good sewe either. OMG! 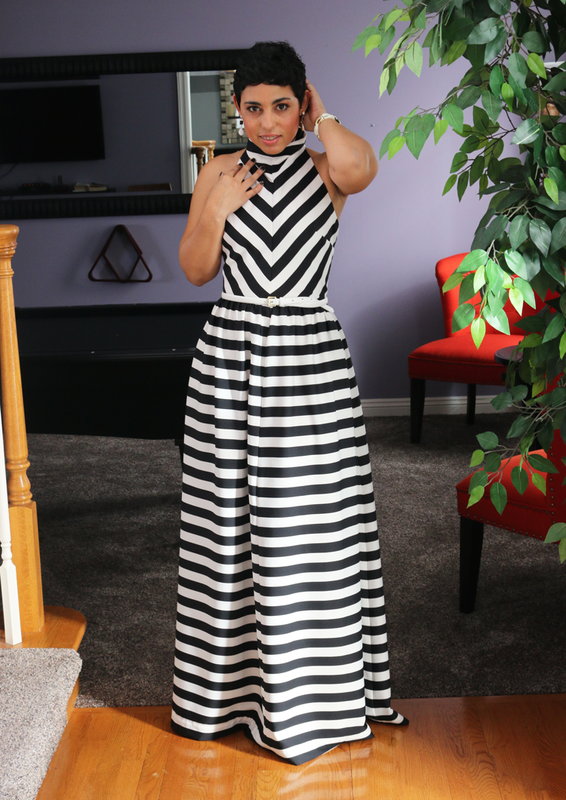 This dress is to die for and the fabric choice is perfect! Would look real sick in a jumpsuit as well. Keep up the great work Mimi! What a material of un-ambiguity and preserveness of precious experience about unexpected feelings. If you wish for to get much from this piece of writing then you have to apply these strategies to your won blog. Thank you for any other fantastic article. Where else may anyone get that type of info in such a perfect approach of writing? Which today turns a massive achievements and a wise course of action out. As an example, girls identified males that were bald to be more ly dominating, an optimistic thing seemingly. What we decide to decide to end up ing is really a traditional-glance piece from TimeWalker series.